SCHOOL HOME LIAISON refers to a “School Home Community Liaison Teacher”. The aim of the “School Home Community Liaison Teacher” is to develop partnership and co-operation between parents, teachers and relevant community agencies. Everybody works together with the best interests of the children in mind. Parents are encouraged to participate more fully in their children’s education and to become more involved in the life of the school. We encourage parents to become aware of their own ability in enhancing their children’s educational progress. Gardiner Street School has a dedicated full time School Home Community Liaison Teacher (S.H.C.L.T.) whose job it is to provide this essential link between home and school. 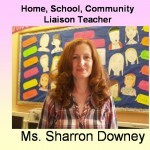 Our S.H.C.L.Teacher is Sharron Downey. Sharron is available from 8.50am – 2.30pm each school day. Parents can drop into the school and meet Sharron. Parents may phone Sharron at 087 6364351.